Happy Friday!!! Thursday night was fend for yourself night, and I was craving Chipotle. I love Chipotle but oddly enough no one in my family likes it, which I think is crazy!! So out of pure laziness, I didn’t want to drive there, so I decided to create my own Chipotle Bowl for dinner. I made this bowl a couple of weeks ago and just loved it and I had to re-make it again to share it with you. Remember back a few weeks ago when I did my freezer cooking? If you recall I froze a batch of roasted sweet potatoes, corn and black beans. One of the best freezer batches I’ve ever done! I used my freezer goodies to make this salad/bowl. This bowl literary took about 3 minutes to make. I popped my whole freezer bowl in the microwave for 3 minutes and it was heated perfectly. While it cooked I chopped up my lettuce and tomatoes. 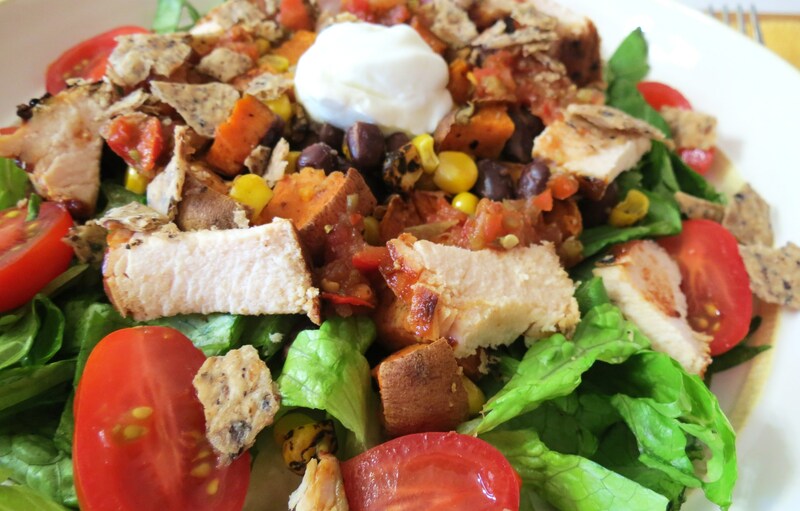 Once my bean mixture was done I placed a little bit of it on top of my lettuce, added some cooked chicken, salsa and greek yogurt and it was ready for me to eat it! I just love quick night dinners! Than it gives me time to work on my blog and just chill for the evening. 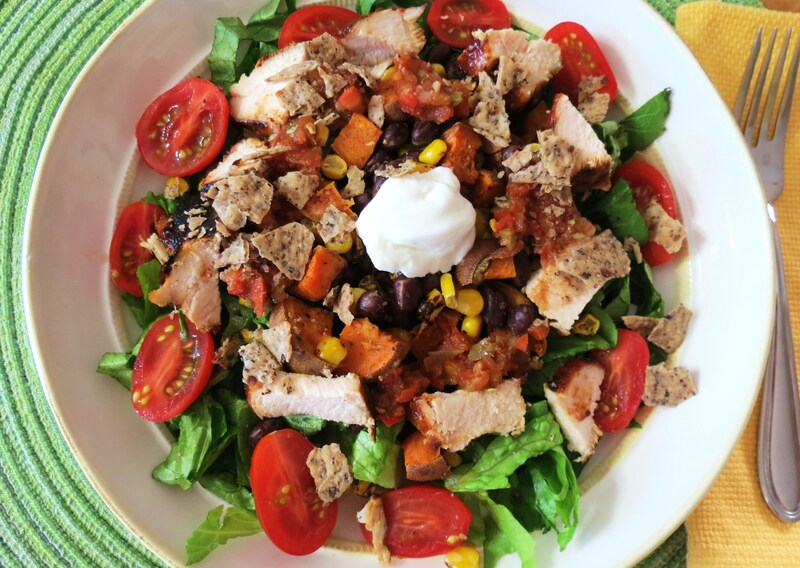 This bowl is just loaded with flavor everywhere. When I roasted my sweet potatoes I used cinnamon, salt and Cayenne pepper for a kick of heat. I used my favorite salsa to give it more flavor and topped it with Greek yogurt to cool off the heat from the salsa and to make it creamy. I have to say I like my bowl better than Chipotle’s because it has more flavor in it, less greasy and I was able to know how many calories I was actually consuming. I figured out the calories the best I could since I used a medley of vegetables, but I am pretty sure I am pretty close to being on. I wish I figured the calories before I froze my batch of veggies. Next time I will! If you like Tex Mex food, you should really freeze a batch of corn, black beans and sweet potatoes. The combination is just wonderful. As I’m writing this I realize the only thing missing in this bowl is an avocado. I just thought of that now. Darn it!! Do you like Chipotle Restaurant? I love it, but I do try to stay away. I really love the Fajita Burritos, but the calories of the burrito is through the roof! The calories for just the flour tortilla shell is 290 calories. I don’t even get much on it, just chicken, fajita vegetables, lettuce and salsa and I’m looking at 540 calories and 16 grams of fat! So I skip the shell and I get my bowl with black beans added and I’m at 370 calories and 8 grams of fat, much better and not to bad for a dinner! Now the chips are a whole other story! The chips with medium salsa is 585 calories. Ahhhh!!! But ohhhh, how I do love their chips! They taste like there’s lime on them and so much salt. Why does good food have to be so high in calories? Now every now and again, I’ll order my burrito and chips, but only as a treat. I do, really believe you shouldn’t stop eating what you love, you just have to do it in moderation. So if I’m going to be good all day, than I’ll get a burrito, if I’m bad I’ll get the bowl. So what do you order at Chipotle??? 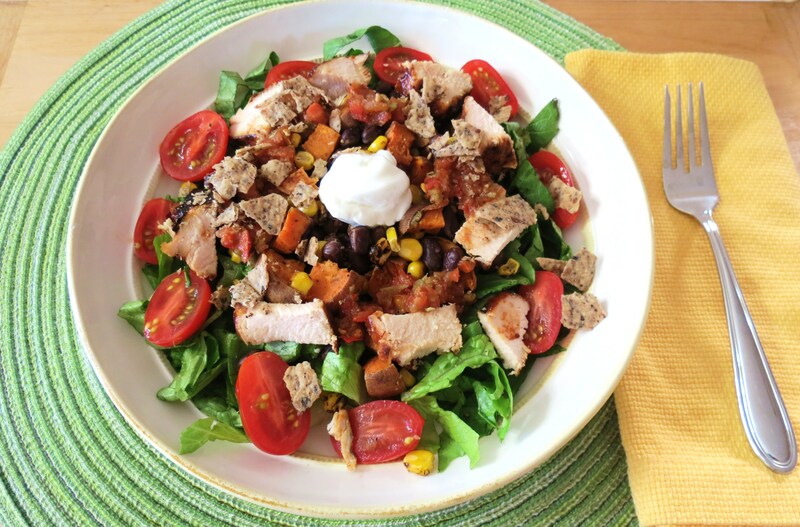 A Chipotle bowl full of flavor and spices filled with black beans, corn, chicken, sweet potatoes. Makes for a quick and healthy lunch or dinner. 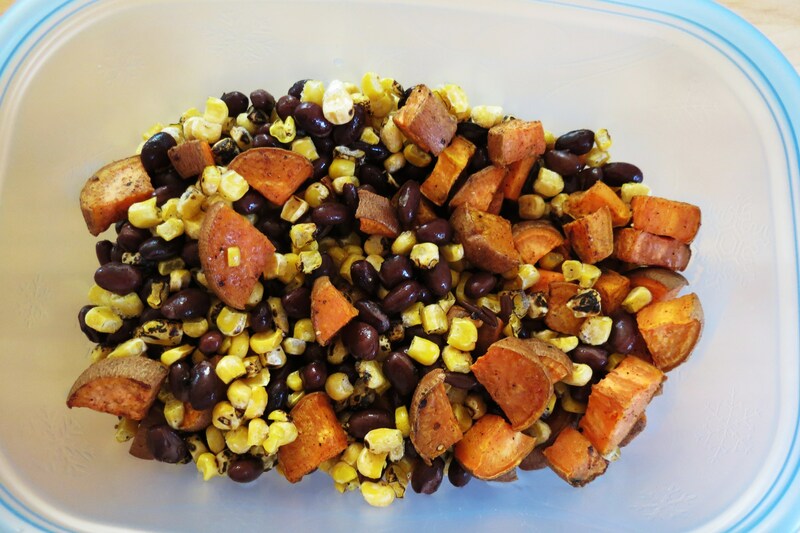 In a microwave safe bowl add beans, corn and sweet potato and microwave for about 1 minute or until warmed. 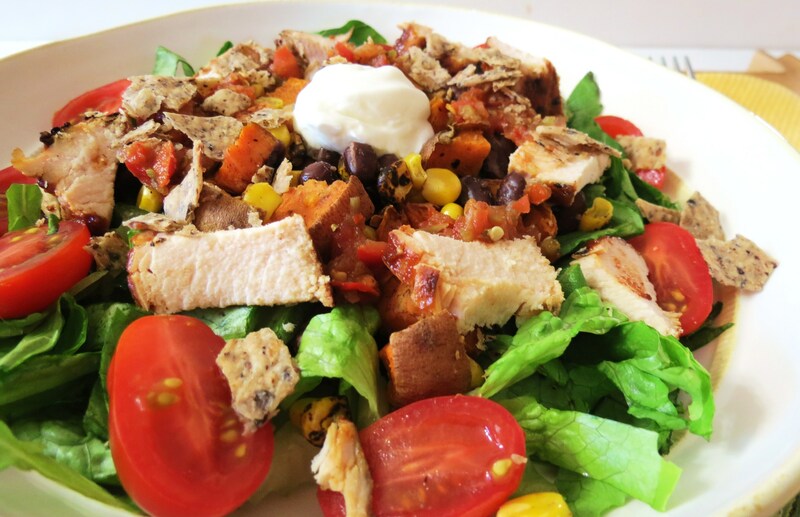 In a bowl add the lettuce, tomatoes, chicken, black beans, corn and sweet potato. Top with salsa, greek yogurt and chips. I would love to chat more, but it took me almost 3 hours to write this post. It seems I am having computer issues. While I was writing this I had to contact my host server and I was informed they may not be able to handle my blog anymore. Oh no!! I downloaded an optimizer plug-in so I’m hoping that will help. So I am cutting this short, since I can’t down load anymore pictures. Forgive me on this one! Have a great Friday and wish me luck with my computer issues. I hate these kind of problems! 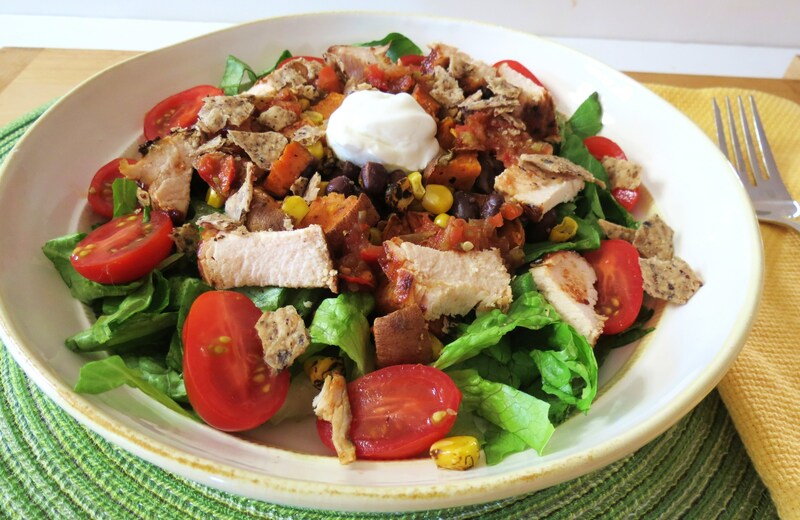 I love Chipotle, but I feel like I can make the same thing at home, so I rarely go! I agree!! Homemade is so much better! This is such a big bowl of tastiness! I love chipotle’s food but it’s such a calorie nightmare and even though I always MEAN to eat half…somehow the whole bowl ends up in my stomach. I love your version! I could never eat half of anything from Chipotle. I best off staying away!! I try to be good with my bowl, but there chips are my favorite! I ate a vegetarian burrito bowl from Chipotle for lunch today, as I often do during the work week. I love them but anything homemade is always better! Can you come make this for dinner for me? I love Chipotle, but hubby isn’t a fan 🙁 Today was just way too long and stressful, cooking is the last thing I want to do! But this sounds delicious! Not liking Chipotle must be a man thing, because my Hubbie won’t eat there at all! I hope the stress goes away for you, maybe your Husband should make dinner for you!? 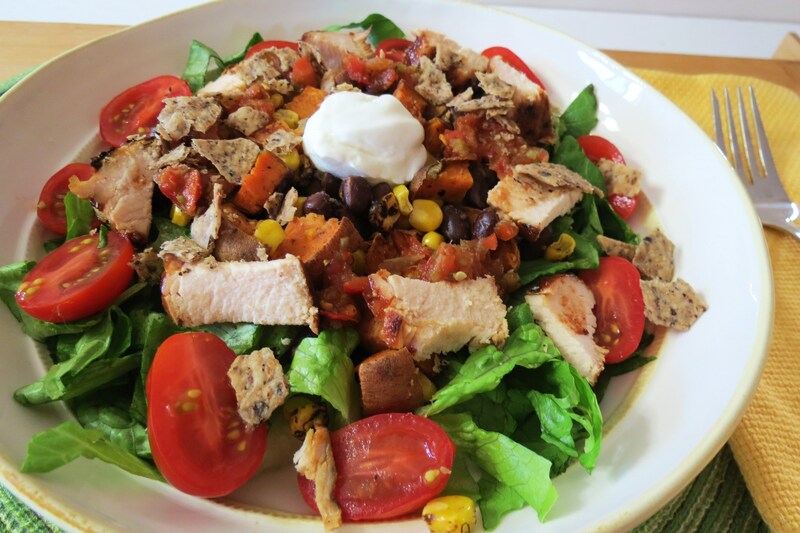 I think I like the looks of your salad better than Chipotle! Oh, and you are NOT lazy! for sure! lol, I feel lazy sometimes! 🙂 I have to say the is more fresh than Chipotle! I’ve been meaning to post my own version of the Chipotle burrito bowl too but I haven’t still. I actually make mine differetly cuz I don’t like beans or chicken. I’ll post it someday. But yours look delicious as well. Great idea to add the sweet potato! I can’t wait for you to post yours!! I’ll keep my eye open for it! Yah! Thanks Amee!! I love your Fit and Fabulous Friday’s! I try to make something healthy to post there! !